Barb spacing: 5", 4", 3", >5"
The machine is extremely rigid to withstand overloading. 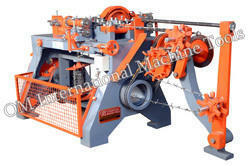 The High Speed Winding Unit revolves at approximately 180 RPM. It produces both 'GLIDDEN' and 'IOVA' double ply Barbed Wire with 2 point, 4 point consecutively.